I cooked my first complete Thanksgiving dinner when I was in 5th grade (no joke, ask my Mom) and every Thanksgiving since then I have spent in the kitchen doing what I love… with the exception this year. It happened to be my scheduled holiday to work this Thanksgiving. In that case, my family ended up dispersing for dinner- Jimmy went to his side’s out in west NJ, my sister had her in-laws over, and my parents decided to go out to eat since my brother was also working. I thought no big deal, the nurse’s at the hospital were planning a potluck so I could at least cook up one dish, bring it in, and have dinner with them. Great, I took a nice little nap anticipating the nightshift ahead, woke up and made a gigantic dish of my cranberry apple and sausage stuffing, played a little fetch with the dog, showered, put on my scrubs…… and then the phone rang, “Hi it’s so-and-so from the hospital, patient census is low so we’re cancelling you for tonight.” And there I sat, Jimmy in west NJ, my sister with company, my parents out, and me at home in my scrubs with a gigantic dish of stuffing. Alone on Thanksgiving. There was a big sad face on this Foodie. Down and out, I eventually wandered over to my Aunt’s house where dinner was already over. 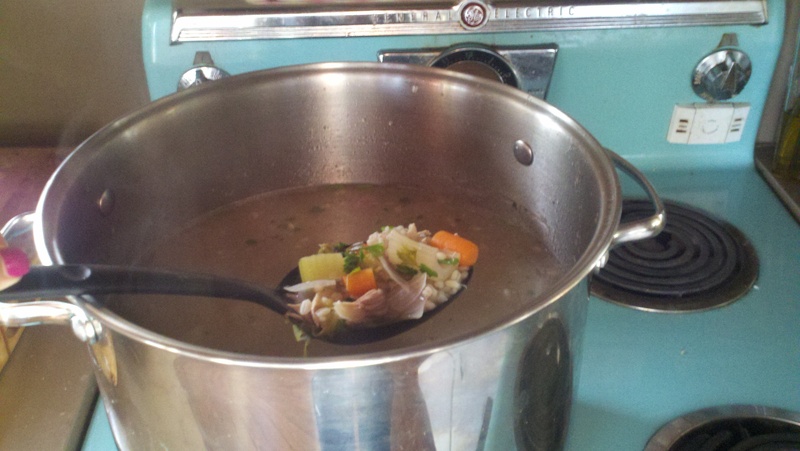 There, I was given a charity turkey carcass which I used to make this soup. For me this Thanksgiving was a bust, but I still must remember all that I am thankful for: my loving husband, close-knit family, great friends, health, happiness, tastebuds, and the fact that I HAVE a job. Even though I am left with this lame turkey soup, I am one lucky girl. Place the turkey carcass in a large stockpot and cover with about 7 quarts of water. Bring to a boil then let simmer for about 1 hour. Strain the stock out of the pot through a collandar or mesh cloth. Remove as much of the meat pieces from the turkey as you can and reserve. Discard other remains of carcass. Return stock to pot, add vegetables, herbs, salt and pepper. Bring to a boil then reduce heat and add uncooked barley. Continue simmering for about 40 minutes or until barley is tender. Add reserved turkey meat. Season to taste. This makes a huge portion (about 8-9 quarts) so I actually used about 3 T. of salt.